Welcome to the Embossing Blog hop! Welcome to the Embossing Blog Hop! We are so excited to have you hopping along with us today! This blog hop is sure to provide lots of fun tips and tricks on embossing techniques , a fun challenge using one of the techniques you see here today and there will be some candy along the way!! So glad you hopped on over! 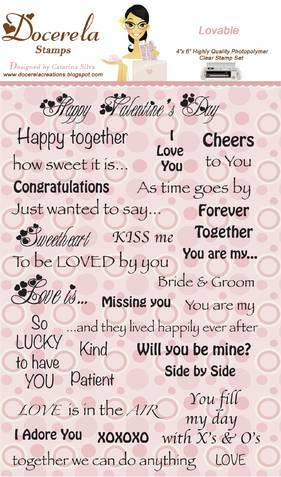 If you hopped over here from Georgiana's blog Carson's Creations then you are in the right place! If not stop on over to Georgiana's Blog Carson's Creations and start hopping from the start! You don't want to miss any of the super awesome projects and fun blog candy give-a-ways!! Georgiana asked us to pick an embossing technique and share a tip, trick or technique. I decided to do dry embossing with highlighting of chalk. The supplies you will need are a Cuttlebug machine, Embossing Folder, CardStock, and chalk. Now you have a great embossed and colorful background! I hope you will give this chalking technique a try! A 5X7 Dominos Cuttlebug Embossing folder and the 5 1/2 X 4 1/4 background paper I made in my video! I will close the comments on April 9 and draw the winner that week! Your next stop is my Great friend Karen at Little Scrap Pieces! Click here to check out what she has in store for you! I cannot believe that Easter is right around the corner! I made this Easter card for a little 2 Year old! I think she will enjoy it! The chick is attached to an action wobble. So of course I needed to make him a Thank you card using the sheet music! It was a little bit harder to work with because it is thin, but I am happy with the end result. Winner at Celebrate the Occasion! As soon as I saw this tag I knew I wanted to make a shabby chic-Tim Holtz-i-fied card with it. I love how this turned out! All the papers have been sanded and inked. 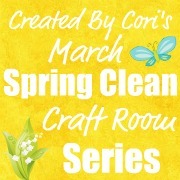 When Cori contacted me and asked me if I would be interested in joining in on her Spring cleaning craft series, I knew it was the perfect opportunity for me to clean house! I have to admit I am a messy scrapper! I have been paper crafting since 2009 and consider it a HUGE part of my life! I enjoy every second that I spend with paper! My Husband built me a great space to craft (you can see the process HERE and I filled it with paper, tools and embellishments and I was quickly running out of space! I often do many quick clean ups but I knew I needed to completely organize everything and the sorting process began! Now I will give you a sneak peak of my room... but you will have to hop on over to Created by Cori's to see all of my space and a fun video! I sorted ALL my supplies! Buttons with buttons, ribbon with ribbon etc. I used boxes during the sort to help it go faster. Here is a video showing my completed space! 1. You must be a follower of my Blog and leave a comment here! Sticky Squares, Frames, Flowers and 3 tubes of glitter! Thanks for stopping by to see my craft room! Food challenge and Stroll through the Park Challenges!! Come join the fun! Just a reminder Docerela has a food challenge going on! Enter any project with a Cricut cut of food! Yummo! 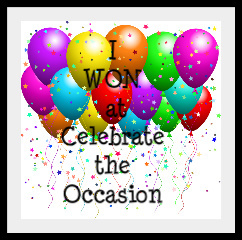 You can be entered to win a set of stamps Whoot Whoot!! Click HERE to join the fun! And have you hopped along the the CCR yet? Come join in on this fun hop and challenge! We have a paper cutter for a prize! I would love to see you over there! Click HERE to check it out! Bring on the flips flops! It is our family motto come summertime in Arizona! Enjoy your Birthday... Man Card! I have been hoarding this great paper from Quick Quotes forever! It was time to use it! 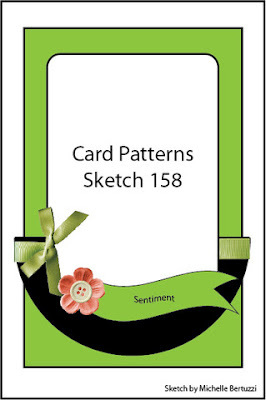 I decided not to include a sentiment until I am ready to use the card. 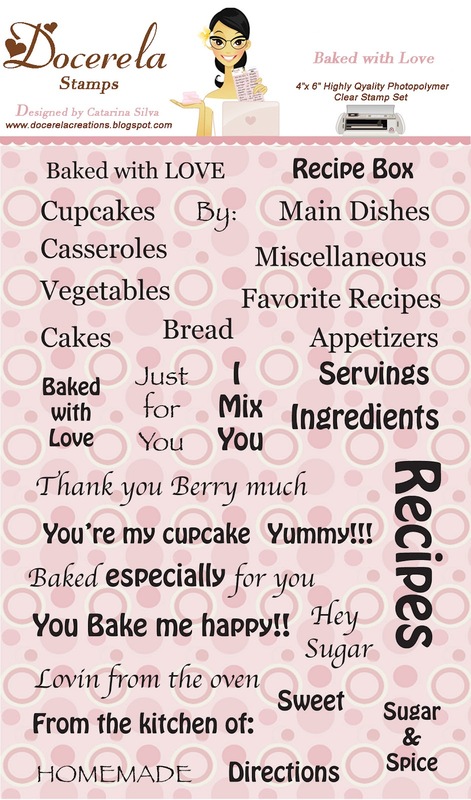 Baked with Love! Cricut Food Challenge at Docerela Creations! Whoot Whoot It's Friday!! Yippee what a great day of the week! If I sat and thought about some of my favorites crafting and food would be at the top of my list! So what a fun challenge we have this week for you at Docerela Creations! Two of my favorite things... Blended! Today's Challenge is to Make a project using any food cut from the Cricut! 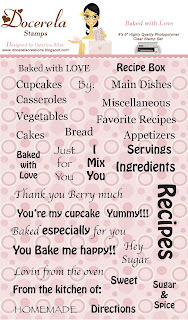 Card, ATC, 3-D, Lay-out, Recipes are all ok! Every time you enter a challenge you get entered for a chance to win a stamp set of Docerela Stamps! Say What?? You heard me right! A Docerela Stamp set up for grabs once a month! And let me just say they are fabulous, stamp amazing and work beautiful with embossing powders! I am excited for today's challenge because I used a cartridge that was collecting dust! WHOOT WHOOT~~~ Sale Alert!! Docerela Creations is offering a special SALE price TODAY (Friday) ONLY!! On Sale $10.00 FREE Shipping! !